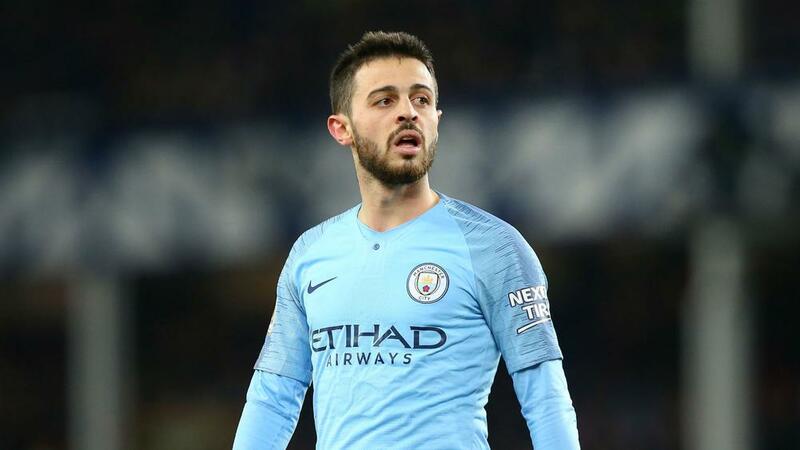 Pep Guardiola feels Manchester City playmaker Bernardo Silva is one of the best three players in the Premier League and Portugal's star performer. Former Monaco favourite Silva joined City in May 2017 and has taken his game to new heights this season, staring in both central midfield and wide attacking roles. Cristiano Ronaldo has not featured for his country since the 2018 World Cup but remains in prolific form for Juventus, meaning Guardiola's observation that Silva is now his country's main man might raise some eyebrows. Speaking at a news conference ahead of Wednesday's Champions League last-16 meeting with Schalke, Guardiola was asked whether the 24-year-old would be the next big star of Portuguese football. "He is the biggest star already," he replied. "He's a lovely person. I love to work with him, he never makes a bad face when he doesn't play. Always the biggest smile. He is the guy in the locker room who is most loved. "He is one of the most talented I've ever seen in my career as a manager and a football player. He can play three or four positions, he's always eight or nine [out of 10] but know when he doesn't play well it doesn't matter because he runs the most. "You cannot play every single game every three days at the top level, but he runs and runs. Maybe this season he's been one of the best two or three players in the Premier League. "Look at how he celebrates the goals with his team-mates, he's a joy. "I'm an incredibly lucky guy to have him in my hands, I enjoy every training session and every single game. "Portugal is fortunate to have him, the manager [Fernando Santos] will use him every time more and more. He is a lovely guy - I love him, it's simple like that." The presence of stars such as Silva in Guardiola's first-team squad has acted as a contributing factor to some of City's brightest academy products seeking opportunities elsewhere. The Premier League champions will come face to face with Rabbi Matondo on Wednesday, less than a month on from the 18-year-old Wales international swapping the City Football Academy for Schalke. He follows Jadon Sancho into the Bundesliga, while Brahim Diaz moved to Real Madrid last month. Guardiola underlined his previous insistence that he wanted all of the trio to stay at City alongside England Under-21 Phil Foden, who scored a brace in Saturday's 4-1 FA Cup fifth-round win at Newport County. "I said with Jadon, Brahim, Phil, Rabbi the same - young players, it depends. Playing for Manchester City is like playing for Barcelona, it's not easy," he said. "[Youngsters] can compete with [Raheem] Sterling, [Leroy] Sane, Bernardo, [Riyad] Mahrez, it's not easy. "You fight for the place and the others compete. We trust them. The others go because they have not had the opportunity. "I won't say it's a bad decision, [Matondo] is going to play more minutes, maybe he needs more time, the future will tell if it's a good or bad decision, but he decided. "I saw him play against Freiburg, [he is] so fast and with minutes he will learn and we are going to see. Not all the players around the world can play for Manchester City. The space [in the squad] is the space." Guardiola confirmed John Stones and Gabriel Jesus did not travel to Germany due to respective groin and hamstring complaints. "It is not a big one for both, according to the doctor, but enough for them not to be here," he explained.